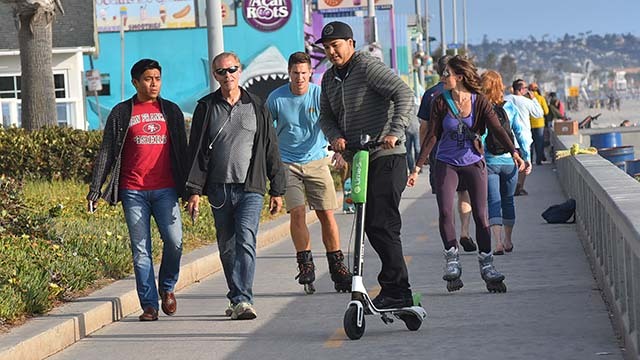 The San Diego City Council on Tuesday rejected an emergency ordinance that would have banned motorized scooters on boardwalks in Mission Beach, Pacific Beach, Mission Bay and La Jolla. State law already bans motorized scooters from sidewalks but doesn’t mention boardwalks. The vehicles have become increasingly common in San Diego since they were introduced in February by scooter-sharing companies Bird and LimeBike. Improper usage and excessive speeding have led to injuries, especially where scooters are in close proximity to pedestrians, prompting Councilwoman Lorie Zapf to seek the boardwalk ban. Her proposed emergency ordinance was voted down on a 6-3 vote, with Barbara Bry and Mark Kersey joining Zapf on the losing end. Councilman Chris Ward said a ban was premature, especially considering city and law enforcement officials haven’t collected data at each of the locations it would have affected. “We’re being asked today to do something on anecdotal information, and I don’t think that’s a good basis for policymaking,” Ward said. Following the failure of the emergency ordinance, a successful motion was made to have the council’s Public Safety and Livable Neighborhoods Committee look further into the issue. Zapf had already left the chamber before she could cast a vote on the final motion.